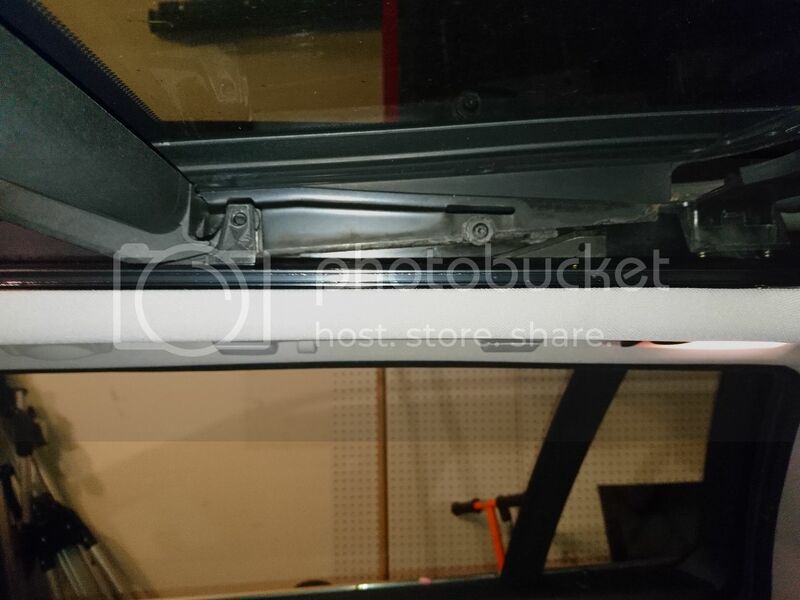 E61 Pano sunroof sunshade headliner sagging - fix in situ? 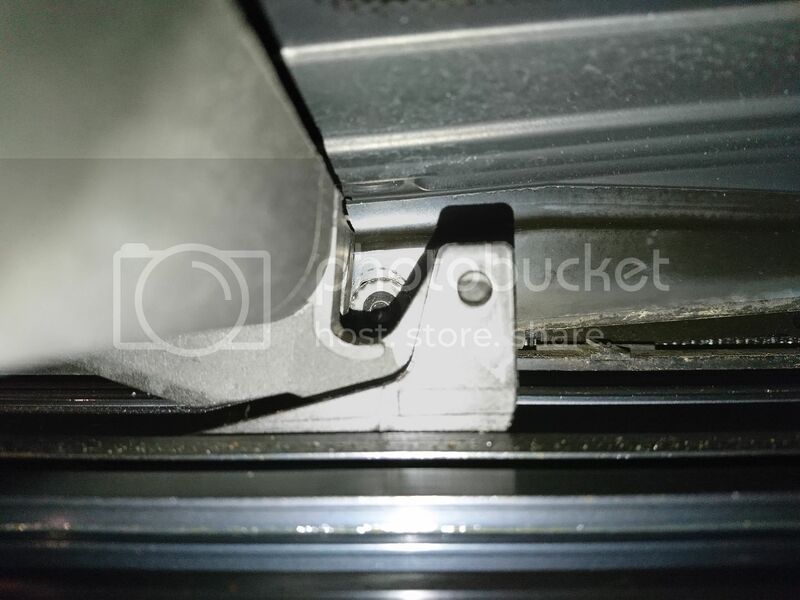 I just bought an E61 550i 2007, sunroof works fine but the front sunshade headliner's cloth is sagging there is no sag anywhere else. I have more pressing things to fix on other cars so don't want to budget time to remove the complete interior headliner and disassemble the sunroof.. has anyone fixed or removed the headliner cloth from front sunshade without removing from car? I might try this on Sunday... if I do, I'll let you know how it goes. I would be extra careful not to pry on anything related to the liner. The mechanism is complicated and breaks easily. The 2 panels float on plastic pieces that tend to break easily. I dropped my headliner and it is a major job. Plan on at least a whole weekend. Interested to see how you get on SportUniversaal , noting DCfjord's comments. Take photos! My idea was to use some large 3m double sided tape squares I bought for holding down 3d printer heater beds. If I can position it correctly I think it would be fine. So, I did do this today. Using the procedure in the workshop manual I linked above, it took me less than an hour moving at a leisurely pace to extract the front sun shade. 1. Retract both sunshades all the way. 3. Remove gaiters at outboard sides of the front glass panel. These are press fit, and it was very easy to remove the lower edges from the sunroof frame, working from rear to front. I left the top edge attached to the sunroof until I had the glass out. 5. Once all the crews are removed, carefully lift the glass straight up and set to the side. 6. 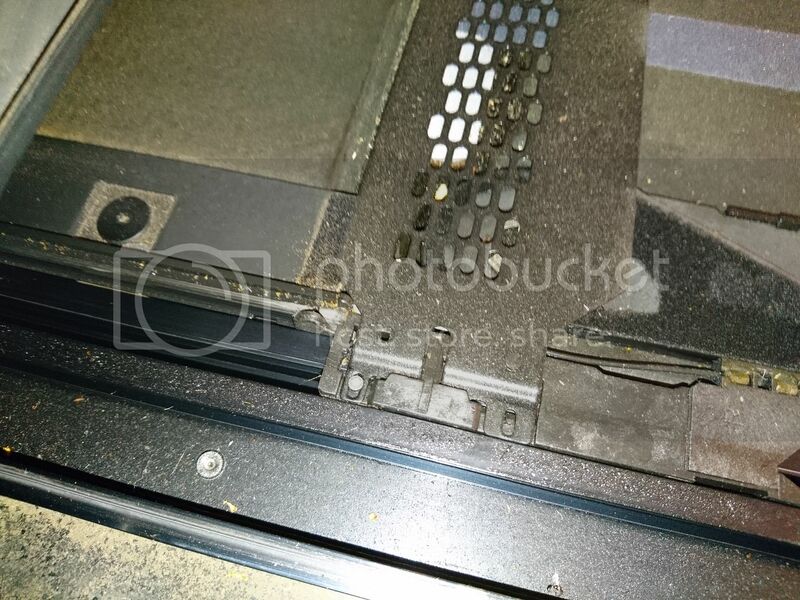 The rear glass is attached to the frame by two T25 screws on each side. Remove these, and then remove the glass by pulling to the rear. You may have to press down on the plastic rain gutter at the front of the rear glass to get clearance. 9. Remove the very small silver screws at both outboard edges of the metal grille using a T7 driver. I didn't have that size available for the removal, but I was able to use needlenose pliers to get them out. NB! When re-installing, do not tighten these screws all the way. They function as retaining pegs, not compression fasteners. 10. Remove the grille by gently lifting it at each end while pulling inboard to free it from the plastic clip. 11. Using a T15 driver, remove the three screws on each side of the top of the front shade. 12. Slide the panel forward to free it. You may have to pull up on the mounting clips just a smidge to release the panel. I'm going to take the panel to the upholsterer's tomorrow to have it professionally done. Re-installation is simply be the reverse of removal, although you have to fiddle around to get the sunroof alignment just right. 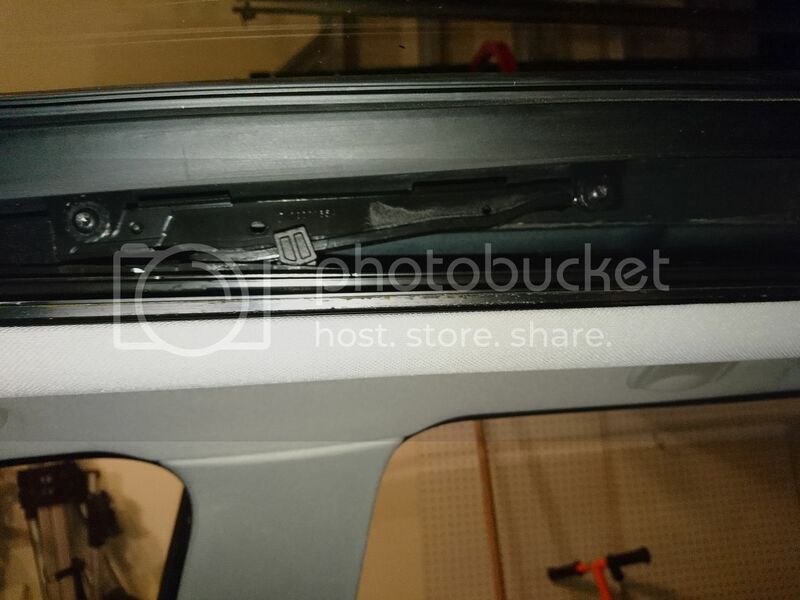 Install the T25 screws that retain the glass panels with the roof in "tilt" position, then lower it to "closed" to make the fine adjustments prior to reinstalling the gaiters. Hope this helps. Glad to dispel for good the myth that the sunshades only come out by dropping the headliner! Let me know if you have any questions. Headliner sagging. Question on rewrap? 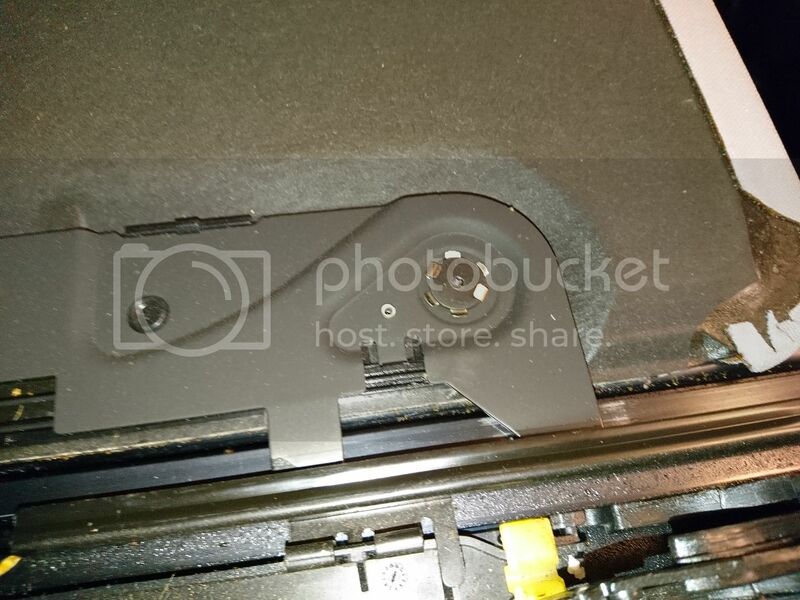 Quick Reply: E61 Pano sunroof sunshade headliner sagging - fix in situ?